It’s not often that Boston Party Machine has been asked to play Sinatra alongside heavy metal…okay…it’s never happened before. But that’s exactly what Jen and Sean wanted at their wedding reception at Water’s Edge Resort and Spa in CT, and we had a blast doing it! Not only were the bride and groom into music, but so were their guests: at one point, we saw everyone on the dance floor shift from dancing to standing/cheering, as if they were watching a concert. Awesome moment! To add to the singularity of the night, Sean and his friends capped off the festivities by coming up to jam, aided and abetted by Pieter, our drummer (check out the pic below of Sean rocking out on guitar while his friend sings lead vocals). Tons of fun, folks! Photo credit: Creative Image Collections. BPM sat down with Jen to talk about their big night, and all that went into “making” their music decisions for their wedding reception. How would you and Sean identify your musical tastes? 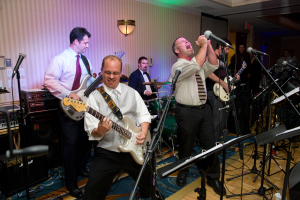 How did you go about selecting a band for your wedding? We both agreed, along with his parents, that the band was the most important aspect of the after party. We’ve all been to those weddings with awkward DJs or the really terrible band that no one wants to dance to and incites people to leave early. We did NOT want that to be our wedding. We were looking for versatility, familiarity with our music tastes, talent (obviously), and energy- a talented singer who doesn’t look like they’re having fun can be just as much of a bust. We listened to a lot of bands on websites, youtube, etc. read reviews, etc. and were really excited by Boston Party Machine – not only the great music samples online but the raving reviews we found on a few sites. On the easy/difficult continuum of song selection, what was it like figuring out the “big” songs for your night? “Our” songs were fairly easy, “his” songs were like pulling teeth, but that’s all Sean’s fault! 🙂 As much thought as he put into what kind of music the night should include (the minutiae…like which song to throw the garter to, etc. ), he didn’t know where to start and then couldn’t make up his mind. Incredible. One thing past brides (not those who worked with Boston Party Machine) warned us on was the terror of working with some of the vendors- be it the band, the caterer, etc. But, we had such a great experience with Boston Party Machine. Through all of the ups and down of our crazy engagement/planning period and the few changes we underwent, Rob was always on top of the communication, always incredibly helpful, and so genuinely nice and concerned. I thought with our unusual tastes we’d have a tough time finding a playlist that worked for us but what he came up with was just perfect- so much better than we could have done ourselves. That’s fabulous to hear! Do you have any favorite musical moments from the reception? Any musical advice you could give another bride and groom? Besides hire Boston Party Machine? Seriously the versatility of this band is incredible. The communication (almost as important in wedding planning as in marriage itself!) was perfect. They have real talent – Lorenzee is beyond words, shocking she’s not on Broadway or recording – one of the most talented musicians I’ve ever heard. And Eddie singing Sinatra – incredible. Again, with Rob, SO professional – so easy to work with, you really feel like he cares about your night as much as you do- they love what they do and it’s so obvious when they’re performing- the energy is off the charts. 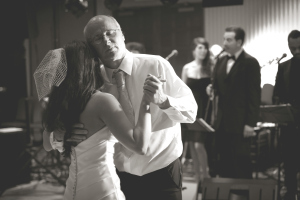 As far as more general music advice – we’ve all been to those weddings with awkward receptions and odd DJs or even odder bands. 1. People remember the music. Seven months after our wedding, people we run into still tell us how great the band was. 2. You’re so caught up in the moment, make sure you include music that your guests will enjoy, even if it’s not your thing. We didn’t get to spend as much time dancing as we thought we would, but the floor was always crowded. We gave Rob our “No Play List” (JUST AS IMPORTANT AS THE PLEASE PLAY LIST) but then just trusted him- things we wouldn’t have necessarily chosen (or that parents asked to be included) went over really well. Wonderful advice, Jen…very thoughtful! Thanks for taking the time to speak with us about the music at your wedding reception. Wishing you and Sean many blessings.